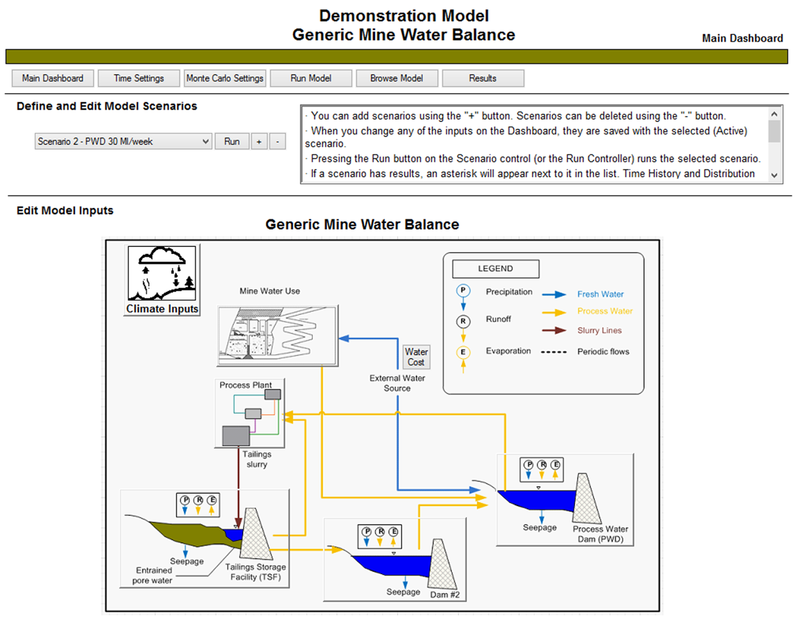 We frequently get requests for an example Mine Water Balance model with dashboards that can be used in sales presentations and as a technical demonstration tool. Recently, a GoldSim Mine Water Balance Model has been posted to the Model Library which fulfills these requirements. A “real” mine water balance implementation in GoldSim would be full of sensitive corporate information and production data. As a result, it is typically difficult to obtain permission to use a mine water balance model, which was developed for an actual mine, as part of a presentation to a general, or external, group. The Mine Water Balance model, in the Model Library, provides a simple, but fairly realistic water balance model for a mine. It contains all of the key mine components, including a process water pond and tailings storage facility, and illustrates how such components can be modeled in GoldSim. Dashboards and graphics were recently added to this model and the model logic was expanded to include scenarios so that the model provides a better demonstration tool. We would like send a special thanks to Alyssa Neir, Senior Project Environmental Planner with Golder Associates, Inc. who added the dashboards, scenarios, etc. to this demonstration model.